BURT MACKLIN IS BACK and all is right with the world. He’s even got a sweet new command center. It’s the SS Knope! And possibly the home that Leslie and Ben will share forever, after she’s elected and Barack Obama comes to her swearing-in. Remember when Bobby Newport’s face was on a bus and it felt so sleezy and over the top? Maybe I should feel like Leslie’s selling out, but I’m just so proud of her for competing. She has a bus! And anyway, Bobby had one first. (Is politics particularly different than being a six year old?) With just one day to go, Leslie’s really in the game now. She has resources, she has momentum, she has t-shirt cannons. That’s all anybody really wants—that and a world without libraries. Leslie’s stump speech is a golden example of how far she’s come. Finally, she can admit that the Harvest Festival was her thing! It’s about time she learned how to take ownership of her accomplishments, and it’s nice to see Leslie go after the Newports with such confidence. On the campaign trail, it’s good to be a steamroller, as long as you aim your rolly thing in the right direction. Like over a dead guy. Wait, what? Nick Newport’s death catches everyone by surprise (“My official statement is that is, overall, a bummer”) and leaves Team Knope scrambling to do damage control. Ben and Ann, Leslie’s little shoulder angels, take opposite approaches. Ben looks at it from a campaign perspective: they stop now and they lose. Leslie hears what he’s saying and encourages her shoulder angels to fight it out. Leslie: Ann, try to beat what he said. Ann: I’m not gonna beat him. Finally Ann admits that she thinks they should put a stop to the games and apologize to Bobby. April wasn’t listening, but she strongly disagrees with Ann. Andy hilariously can’t string a sentence together. Ben and his great body win the argument. What a crack team of advisers we’ve got here. I love them so much. Their panic makes for good comedy as well as a genuine dilemma. It’s hard to publicly mourn the loss of a man who went against everything Leslie stands for, but it’s also not good to call him a jerk after he’s dead. That makes “Bus Tour” a clever response to the question of how Leslie will survive in this world of strategery. I don’t believe for one second that government life will ever warp her, but that doesn’t mean her questions will all have easy answers. Still, I’m a little surprised that it took her so long to figure out what she had to do: apologize to Bobby, no press, no ulterior motives. Leslie’s not the kind of person who manipulates tragedy for her own gain, which she realizes as soon as she sees Jen do it. The best way to beat Jen is to do what she won’t—put people first. That’s convenient, because it’s also the best way to BE LESLIE KNOPE. Leslie: You know what, Jen is right. I’m no better than her. Ann: No, Leslie, yes you are. All you need to do is stop the machine for a second and go apologize to Bobby. Alone, without cameras. Leslie: Thanks Ann, but where was that advice six hours ago? Ann: That’s not gonna work. Ann with the sass! And the truth. 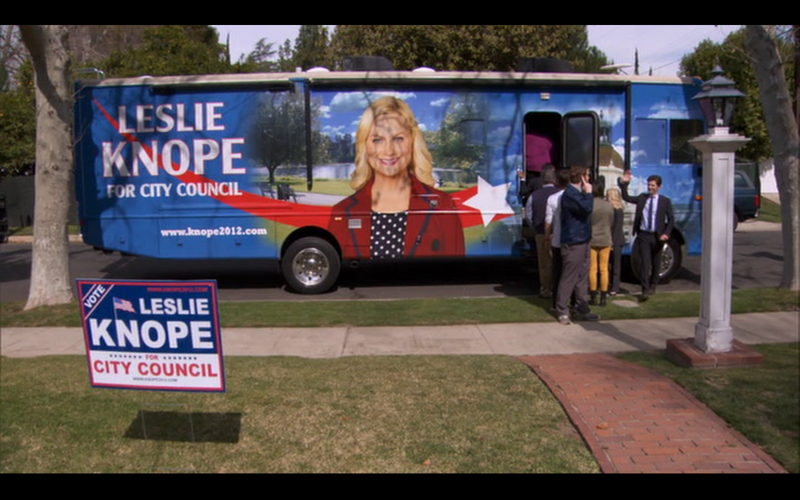 It’s great that Leslie has a bus with her face on it—she just needs to know when to leave it at home. A little too convenient, in my opinion. The intended message, I presume, is that if you genuinely help each other, you’ll be rewarded, even if you’re helping your opponent. I’m pretty sure politics usually don’t work that way, but I’m also pretty sure that it makes total sense for Bobby to be his own undoing. It’s also fitting to see Leslie rewarded for putting people above politics, because that’s what sets her apart. I do really love this show’s optimism; I just wish TV shows would stop suggesting that every time we do something good without hope of recognition, we get recognized anyway. That’s not life, and Parks and Rec is usually smarter than that. Leslie doesn’t need Bobby to put her back in the town’s favor. That’s what her people are for. The team’s devotion to Leslie continues to be the most endearing aspect of this campaign. Leslie affirms them like crazy, but after what goes down at the van rental agency, she’d better throw them a raging waffle party. When Mike O’Malley stonewalls them, Ron offers to give up $10,000 just to get Leslie those vans. How much gold does this man have? Still, it’s Donna’s sacrifice that really steals my heart. Rear-ending O’Malley with her precious Benz? That’s serious business. Elsewhere in Pawnee, Chris is running errands, but only because he’s too depressed to slow down. Depressed Chris isn’t working for me, maybe because his tone is still as hyper-positive as ever. April (Ludgate-Dwyer!) tries to lend a hand by telling him that “dark places are awesome” and reminding him that the women he dated are all lame. Only April could make any of that sound encouraging, but she does, and I’m hoping for more of these two next season. April’s actually lighter inside than Chris is now. They balance each other out. 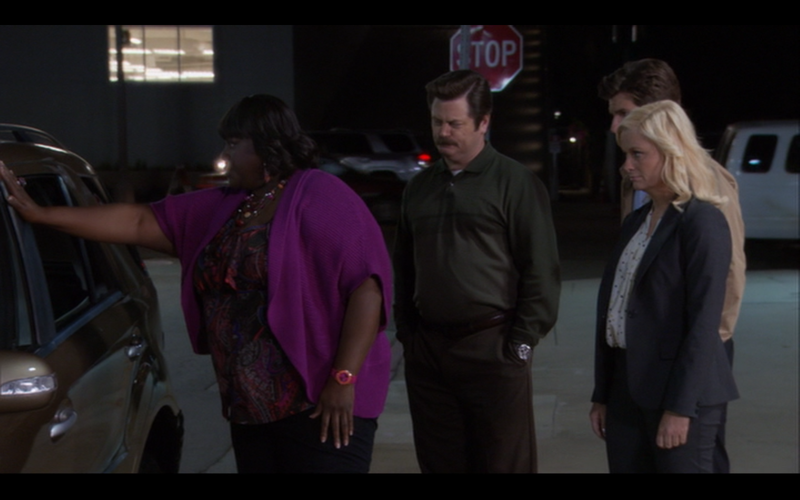 Mr. Ludgate-Dwyer gets my favorite storyline of the night, as Burt Macklin tracks down a pie-thrower. I love Andy’s obsession with the FBI, especially because he clearly only gets it from watching movies. (“If you are watching, perpetrator, just know that you are still at large.”) They all get code names and everything. Sewage Joe turns out to be the perpetrator, but before Andy figures it out, he has to take a pie to Jerry’s face. It’s agonizingly slow and achingly hilarious and possibly the hardest I’ve laughed all season. Jerry looks so sad. He knows what’s coming. We all know what’s coming, so it has no right to be as funny as it is. 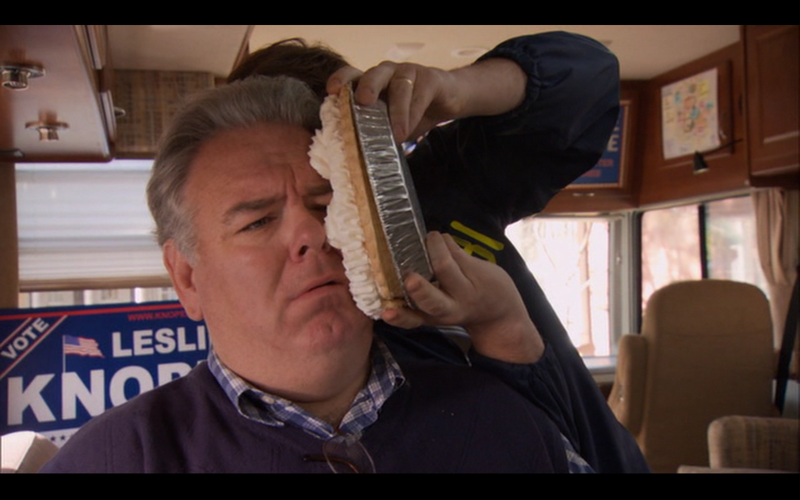 Jim O’Heir’s pout really sells it for me. The little “ohh” as the pie makes contact. The smushing noise. Life in Pawnee makes sense. Tom’s plan to get the vans? Cry. “I need everyone to gather around me in order of how much I trust them.” Jerry takes a step back.